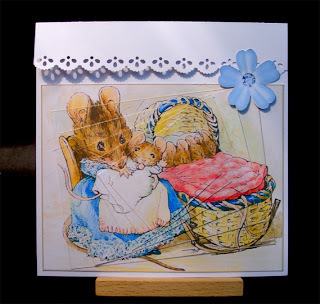 Crafter's Companion Beatrix Potter rectangle twisterpage , C.C. Designs sentiment rubber stamp. What a cute card and image to work with. Thanks for joining us at CropStop! Beautiful card, so sweet and the way you've added the sentiment is fab. Oh I've never seen a card like this before. Very darling! Thanks for joining us at Paper Sundaes this week! Good luck! Beautiful card, she is one of my favourite Beatrix Potter images, adorable! Wow! I love the "twist" on your images. Thanks for playing along with our CropStop Challenge Blog. 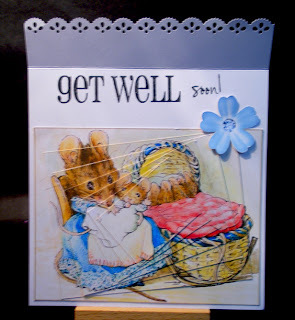 Ive never seen a card in this style before with the top flap, fab idea. Gorgeous image, always loved these stories. Thanks for joining us at Paper Sundaes for our lots of layers challenge. WOUW such a cute card. These Beatrix Potter images are just too cute, I think. Lovely creation here.